During a session on Multimodal transport at TrafficInfraTech Expo, the panelists M Ramsekhar, Managing Director and CEO, Delhi Integrated Multimodal Transit System, NVS Reddy, Managing Director, Hyderabad Metro Rail Ltd., Pravin Goyal, Director-Systems, Kochi Metro Rail Ltd, Pawan Mulukutla, Head – Integrated Transport at WRI India Sustainable Cities and R Venkatesh, Director, Maganetic Autocontrol discussed how different components of multimodality space interact with each other and the issues that the country is grappling with. It is important to look at multimodal integration from the perspective of endusers and not just the system or the agency that is designing. Whom it is for and how does it benefit? The different modes of mobility include walking, cycling, autorickshaws, taxis, buses, cars and two wheelers. Given that the forms are different, the travel patterns will also be different, so how do we integrate these? 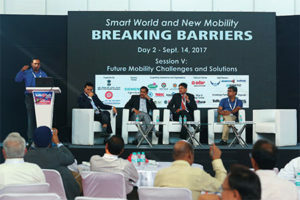 Responding to the need, Pawan stated that unless we have a functioning Unified Metropolitan Transport Authority, multimodal integration would not become a reality. Non-functional UMTAs are becoming a major hindrance for multimodal integration. 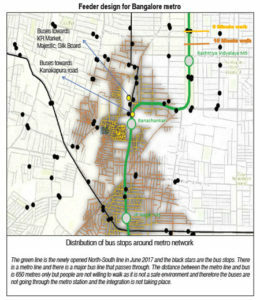 “WRI did some survey in two or three stations around and we figured out that fifty percent of the users are actually bus users and if there is no integration of feeder bus systems with the metro systems, it is going to be a disaster. Unfortunately, Bangalore is learning that lesson because of lack of coordination between two agencies has become a very major challenge. This is an interesting data says that 44% would be metro riders who are currently preferring alternative means of transport due to limited connectivity and it could be same in Hyderabad and or in Chennai and other cities. And when you are talking about elements we need to focus on pedestrians, feeder bus systems, autorickshaws and taxis and how do you ensure parking. These are the Tender SURE footpaths in Bangalore which have been really well done. So, we can have infrastructure like this and this is something that other cities should really replicate and implement for pedestrians. “In Bhopal which has one of the first dedicated cycle tracks in India, the authorities launched a bike sharing system which is being integrated with BRTS and city bus services. It is completely a digital system involving automated bikes. Every five minutes a new rider is joining this bike sharing system and this is one example where things can be done really well. These are the dedicated cycle tracks. Under one of the stations, they have given dedicated terminal for buses which is also working out well. Another example is the Thane station (suburban), where you have dedicated bus terminals and autorickshaw lanes. WRI is also experimenting with improving the junctions near stations. Even though we have signals there is no significant, dedicated lanes for different modes. We did simple experiments in partnership with police in Mumbai, Bhubaneswar and are repeating the same thing in Kochi also. When we organize the spaces, the fast turning ‘left turns’, ‘U’ Turns, vehicles are a little more organised and space is available for pedestrians. 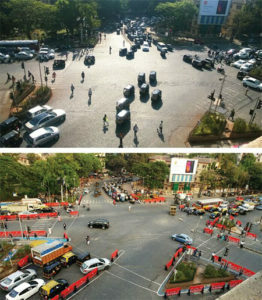 There has been an intersection revival project in Hyderabad as well. We need to consider feeder buses which are like 4 kilometres or 7 kilometres because they need to have quick turnaround. If a metro service frequency is every three or four minutes, we cannot have bus frequency at 15 minutes; at least the bus frequency needs to be five to six minutes. For this to happen one really needs to think of services taking into consideration economic viability because we know that many of the operators are into loss making. Kochi Metro has launched the smart card an open-loop system adopted from the standard prescribed by the government. We have a lot of private developers who are coming up with several apps. By opening up the data and creating an open data policy, market can decide how many apps can be put in place. In Mexico and Chicago, the authorities opened up the data and what we saw was hundreds of apps were developed and people chose to use whatever they wanted to.